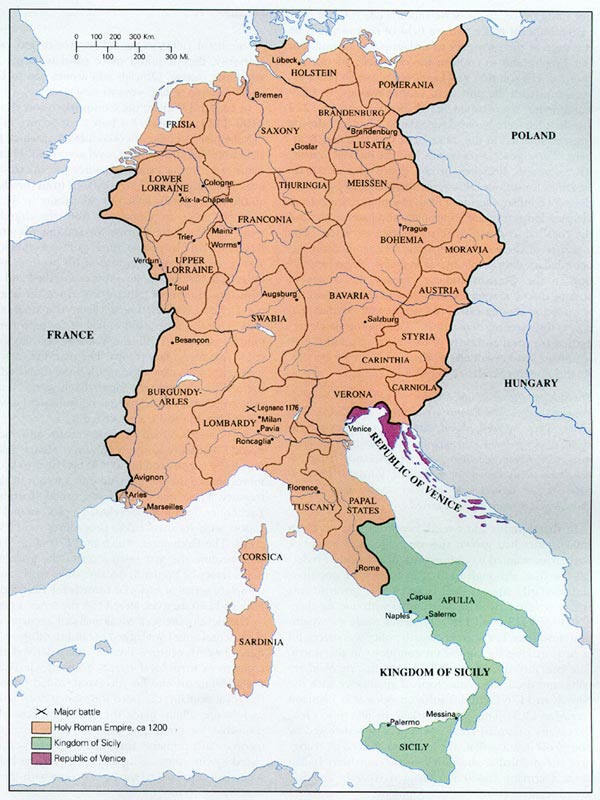 Holy Roman Empire - The Holy Roman Empire was a confederation of independent states in Central Europe which existed from 962 until 1806 (although some put the foundation as early as 800 with the coronation of Charlemagne). Central Europe was unable to unify into a single sovereign country when most of Western Europe had already done so. While they maintained their independence, they had a tendency to align themselves with the most powerful monarch of the states and sometimes this monarch would be crowned as the official emperor (or Holy Roman Emperor) by the Pope. The intention was to revive to former glory of the Western Roman Empire which had fallen centuries earlier. The Holy Roman Empire officially came to an end when the territory comprising it was absorbed by Napoleon and the defeat of its last emperor, Francis II at the Battle of Austerlitz. After Napoleon's downfall, the empire did not re-materialize as the territory finally began to coalesce into sovereign states.